Remember Volvo's crazy fast S60 sedan concept developed by their motorsport team Polestar? Well, it was pretty much the car from Scandinavia we all wanted. Chris Harris loved it too, and it just went into production. Sort of. The only problem is that for now, only Australians can get it, with less power. Is Volvo&apos;s 508 Horsepower S60 Polestar As Amazing As It Looks? While it weights the same as a normal S60 R-Design, it has a 350 horsepower (down from 508 in the concept Harris drove) 3.0-liter I6 engine with 368+ pound feet of torque. The Borg Warner turbo is new just like the bigger intercooler, the engine redlines at 6500, and while it has only 25 horses more than the standard S60 R-Design, the chassis modifications may be able to compensate that up to a point. The Polestar comes with Öhlins 2-way adjustable shocks, upgraded springs, stabilizers, tie blades and toe link arms. There are 235/40 Michelin Pilot Super Sports on the 19 inch rims, and the ventilated brakes come from Brembo. With the remapped softwares for both the six-speed automatic and the Haldex 4WD system with launch control, the S60 Polestar will reach 62 mph in 4.9 and climb all the way up to a limited 155. That's not exceptionally fast, but it makes for a much more useable performance car than what the C30 Polestar can offer. The limited production run has been developed for the Australian market as a pilot project, so your chances of getting one elsewhere is all down to Aussie buyers. They might bite, but it's certainly no Holden. 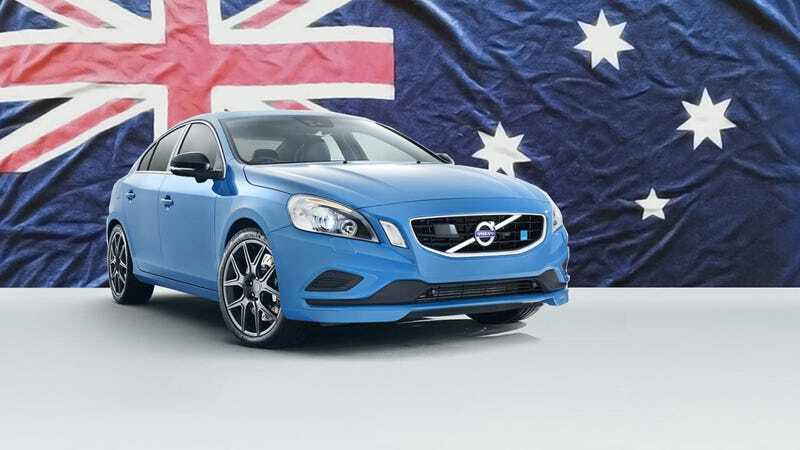 Still, in case Volvo's plan with the Polestar brand doesn't work out, we can all keep smiling while America finally gets a Swedish wagon.